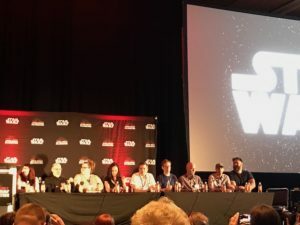 On Friday at Star Wars Celebration there was a roundtable discussion with writers of both Star Wars books and comics. The Lucasfilm Publishing Writers’ Roundtable was more of a question and answer session with questions coming from fans on twitter. Even so it was interesting to learn more about the writing process and how these authors write a Star Wars novel or comic. The authors also had a great time talking about their passion for Star Wars and answering some fun questions like where would you vacation in a galaxy far, far, away? As a writer I came away with a new understanding about the writing process and inspiration, it was also one of the most entertaining Behind-The-Scenes stage panels. Following the discussion we got a very brief look at upcoming books and comics with little in the way of actual details. At least we have covers and know the main premise of each book. The Marvel panel on Saturday went deeper into the comic announcements. 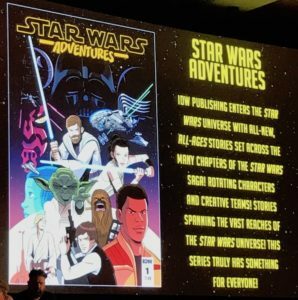 Children and young adults are the main focus of the new products but there will be books and comics for adults and Star Wars fans of all ages. Left to Right: Timothy Zahn, Beth Revis, Delilah Dawson, Michael Kogge, Jason Fry, Ben Blacker and Ben Acker. 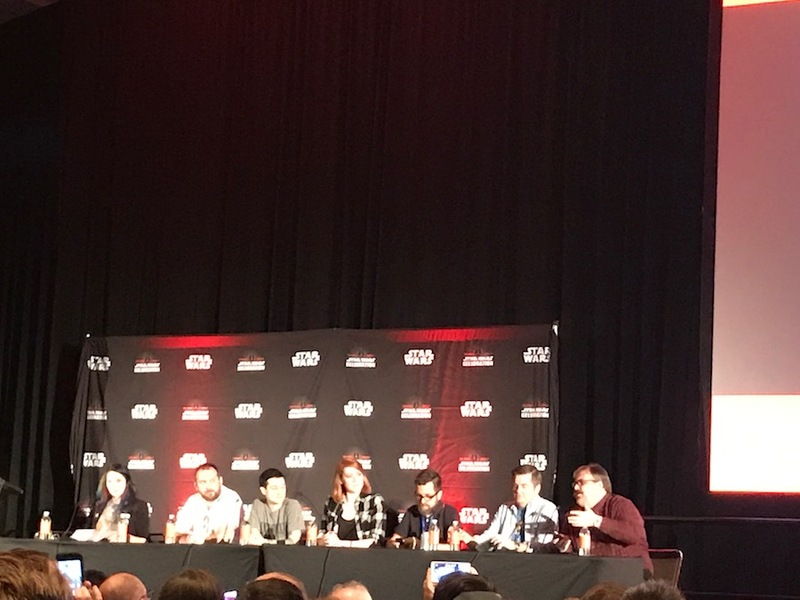 The authors on the panel were Timothy Zahn (Heir to the Empire, Thrawn), Beth Revis (Rebel Rising), Delilah Dawson (The Perfect Weapon), Charles Soule (Poe Dameron, Darth Vader), Jason Fry (Rogue One Rebel Dossier), Michael Kogge (Poe Dameron Flight Log), and Ben Acker and Ben Blacker (Join the Resistance). The first questions were focused on how they came to write Star Wars and their preparation for writing. For Charles Soule he was working at Marvel when they first announced doing Star Wars comics. Every writer wanted to do it but he got picked then went on to write the Lando series. Some of the writers listen to music when writing including Star Wars music. Though silence is also good not to put the wrong emotion into the scene. Timothy Zahn had the answer to a question we all wanted to hear. His book Heir to the Empire, where we first met Thrawn is now Legends but his new book Thrawn just came out April 12 is canon. This book is about Thrawn’s early Imperial Navy career from the time he was rescued from Chiss exile up to his entrance in the Rebels animated series. When reading the book, and I will be writing a full review in the coming weeks, it is clear that this is the Thrawn from Heir to the Empire and Outbound Flight. Something’s have changed but the character Thrawn and his backstory as a Chiss commander have stayed true to the original character. The question was about sticking to canon and Timothy Zahn didn’t find any problems getting Thrawn into the new canon. He went on to say that Thrawn is still the same character but written in a different era. It is putting the Chiss officer in a new timeline and writing his story from old stories. Zahn also said because there are so many places to go and put your story in the Star Wars universe it is not that restrictive for a writer. 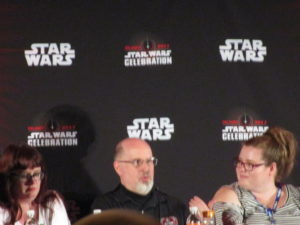 Timothy Zahn speaking during the Writers’ Roundtable, on his right is Beth Revis, and left moderator Jennifer Heddle. Another great answer by Timothy Zahn was when asked if it is more enjoyable to write established or original characters and he gave a very long thought out answer. To get established characters right you have to get them most of the way correct so the reader can fill in the rest. If not then the audience will know because those characters already have a history. Beth Revis in Rebel Rising writes about the period of Jyn Erso’s life from when Saw Gerrera picks her out of her hiding spot to when she is seen in prison at the beginning of Rogue One. She said that it was an amazing experience to write that story and how she became that character we see in the movie. To round out this discussion was Delilah Dawson who wrote about Bazine Netal in her book The Perfect Weapon. She is the mercenary in Maz’s cantina in The Force Awakens who alerts the First Order. When she was given the character she had to develop her from a picture and the very brief dialogue in the movie. For Dawson it was a challenge to identify this woman and to find meaning in her appearance. The consensus was two fold, one the authors enjoyed creating characters from an idea or picture but also backstories of established characters. We know Jyn’s story helping the Rebellion retrieve the Death Star plans and how she got there from an Imperial prison, but what we don’t know is the part between hiding as a child till the prison. This is where this author’s come in; they give us the stories the movies and television series do not. Charles Soule gave the audience some insight into Marvel’s new Darth Vader series. He mentions that it will take place in year one after Darth Vader gets the armor. In the Marvel panel we heard the series begins after he rose from the medical slab in Revenge of the Sith and was crushing the medical droids. The story begins right after his famous “noooooo!! !” through his first missions given by Emperor Palpatine. These are focused on hunting down the remaining Jedi that escaped order 66. Jason Fry told us about how he named a “trillion clone troopers” in his three Clone Wars Visual Guides by DK Publishing using “dorky references to NY Mets players”. One of the best ideas was from Ben Blacker who wants to do a young Admiral Ackbar series based on his early academy days. Not only that but how the Mon Calamari designed space ships for the Rebellion but the species lives underwater. Answers to burning questions that fans need to know. Timothy Zahn would like to do an Obi-Wan book about his adventures between Revenge of The Sith and A New Hope. Another fun question was where would you vacation in a galaxy far, far, away? Timothy Zahn said the upper levels of Coruscant and if you read Thrawn you would know why he says that. Beth Revis mentioned Scarif before the Death Star boiled away the clear water and tropical beach landscape. 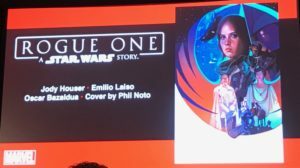 A little more insight into the Poe Dameron series and BB-8 came from Charles Soule when he told the audience how lines were written out for the droid’s dialogue before becoming beeps and bloops. The character that speaks afterwards will then repeat what BB-8 said acting as the translator. Soule ended up making a dictionary of all the droid noises. 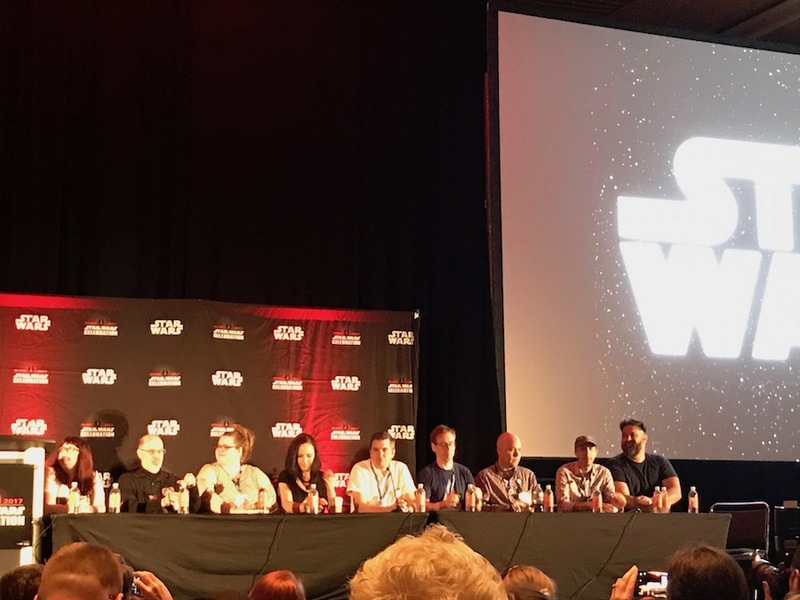 The question and answer period ended with the departure of Timothy Zahn and the addition of Chris Ryall, Chief Creative Officer and Editor-in-Chief of IDW Publishing. He gave us a short introduction to Star Wars and IDW and how the publisher does licensed comics but little with Star Wars in the past. They mainly focused on the micro-comic packs, where they reduced marvel comics and movie adaptation comics down in size, along with the Artist Editions and Newspaper Strip reprints. We then got news on IDW’s new projects along with other new books and comics. First, IDW announced a new monthly comic series Star Wars Adventures debuting in September. This series is aimed at all audiences but mostly young readers who are not yet ready for the Marvel comics. It’s a series that is adventurous and fun spanning both movies and television shows with all our favorite characters. Another Young reader series announced is Forces of Destiny with two books coming in August and October featuring the women of Star Wars Jyn, Leia, Ahsoka, Rey, Sabine, and Padme. 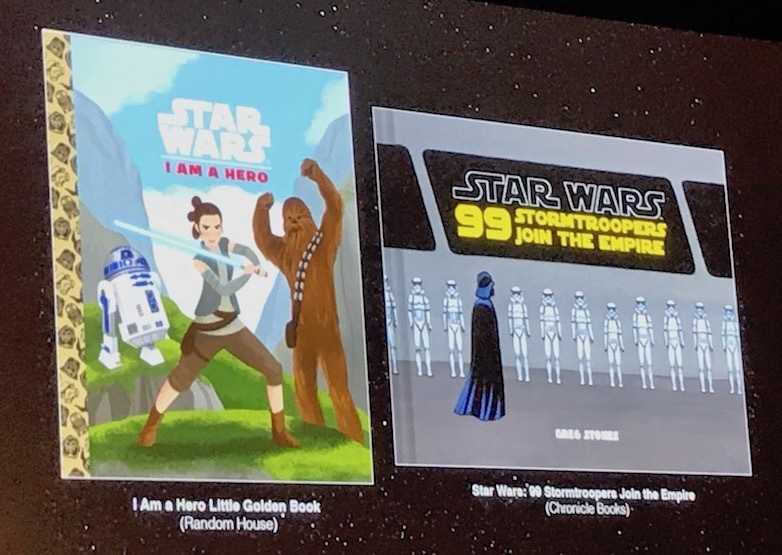 The Little Golden Book I Am A Hero from Random House and 99 Stormtroopers Join The Empire from Chronicle Books were also announced. 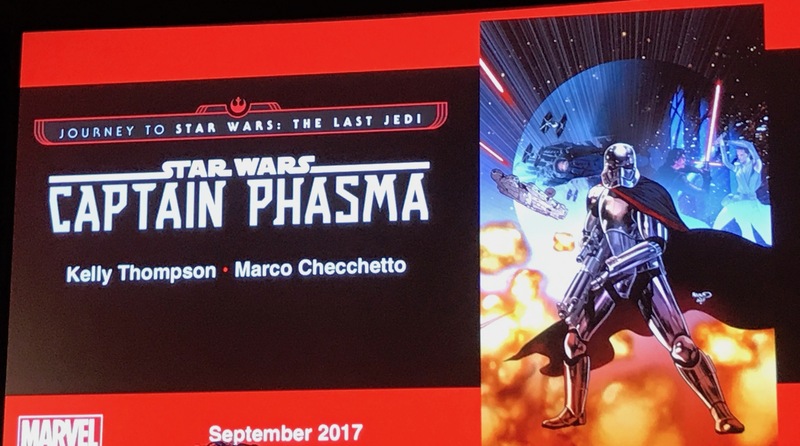 One of the biggest announcements was the Journey to The Last Jedi series that begins with Phasma by Delilah Dawson. Marvel is releasing a Captain Phasma five-issue comic series by Kelly Thompson and Marco Checchetto in September. At the Marvel panel on Saturday they said the series takes place following the destruction of Starkiller base in The Force Awakens. In the movie Finn and Han manipulated Captain Phasma into shutting down the shield. With the suggestion from Han the audience assumes she was dumped into a trash compactor. This series will be about how she escaped from Starkiller base and what she has been up to as we go into The Last Jedi. 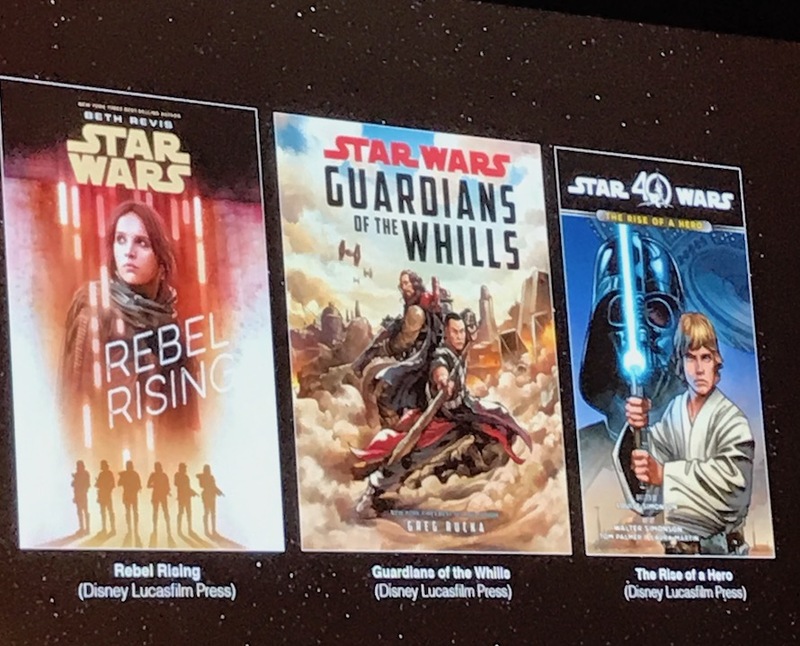 There is also a Young Adult book for Journey to The Last Jedi titled Leia: Princess of Alderaan by Claudia Gray and The Legends of Luke Skywalker by Ken Liu. 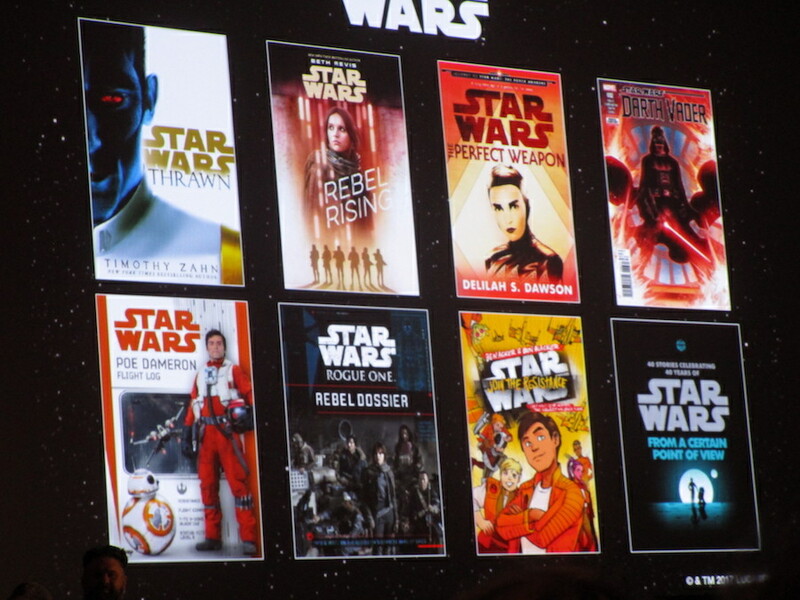 We are also getting Rogue One novels. 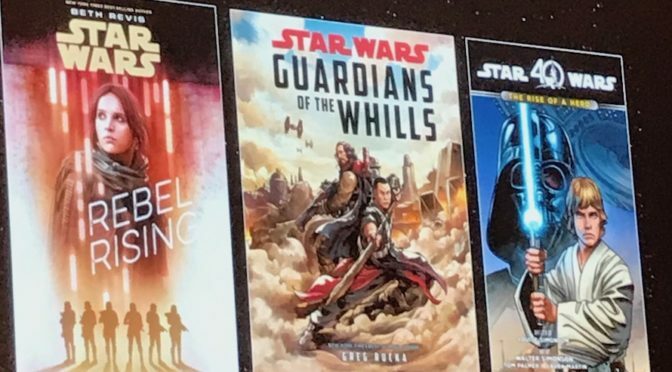 These are Rebel Rising by Beth Revis, and Guardians of the Whills by Greg Rucka. 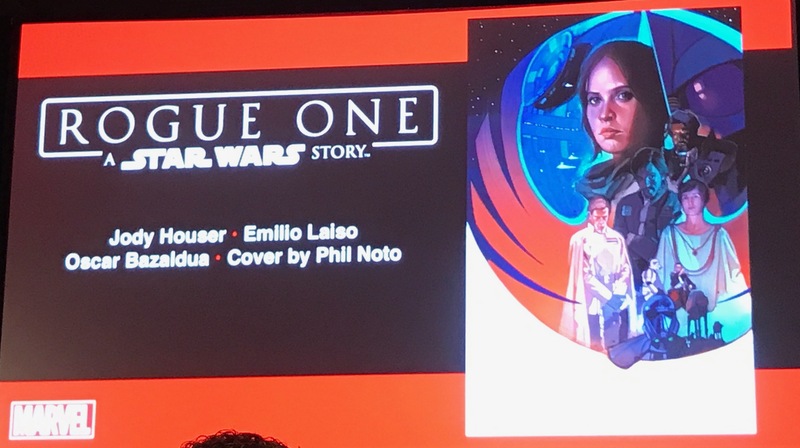 Also announced is a 40th Anniversary novel from Luke’s point of View titled The Rise of a Hero by Louise and Walter Simonson. 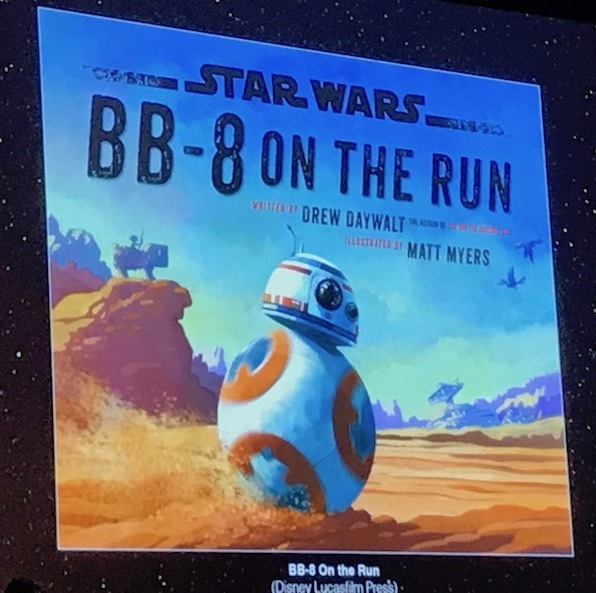 Some other books for young audiences will be a charming little picture book, BB-8 on the Run. This will tell the story of BB-8’s adventures on Jakku from when he says goodbye to Poe until meeting Rey. We are also getting a second book for the Join the Resistance series by Ben Acker and Ben Blacker. The first Star Wars STEM book is coming that will teach children how to code. It will be titled Star Wars: Coding Projects by DK. 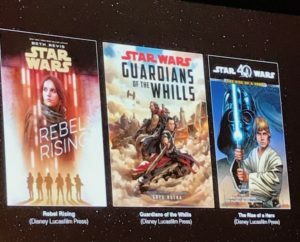 Also announced was Star Wars reads is coming back not just for a day but the entire month of October. Those were the main books and comics discussed in this roundtable. The Marvel panel on Saturday went more in-depth with the comics and further announcement of the new Marvel titles. Saturday’s panel at Star Wars Celebration featured artists and writers working on the various Star Wars comics for Marvel. They came to not only discuss their latest work but also give us a glimpse at some upcoming issues and titles. Right to Left: Jordan White, Charles Soule, Phil Noto, Heather Antos, Matt Martin, John Taylor Christopher. The panel’s guests were Star Wars editor Jordan White who also does Deadpool and Guardians of the Galaxy, editor Heather Antos, artist John Taylor Christopher (Star Wars Action Figure Variant Covers), artist Phil Noto (Poe Dameron, Chewbacca), Matt Martin (Lucasfilm Story Group), and writer Charles Soule (Poe Dameron, Darth Vader). 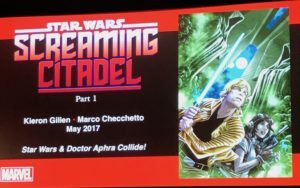 First comic to be revealed was the Screaming Citadel issue #1 by Kieron Gillen and Marco Checchetto. 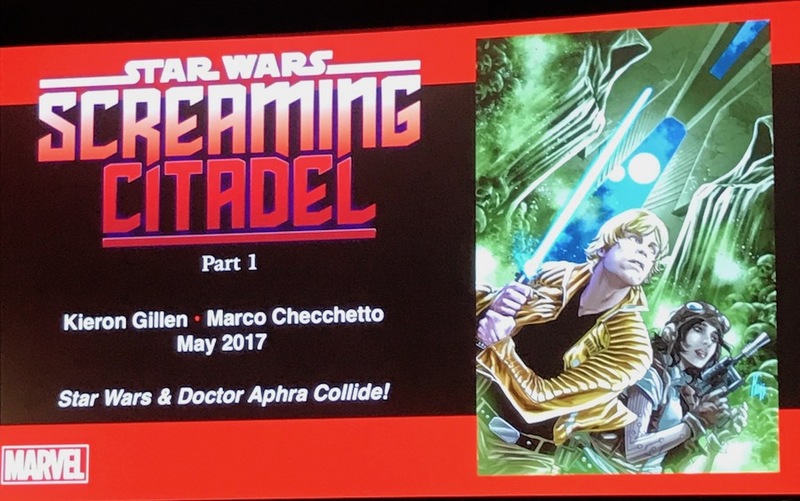 The story is a crossover between Doctor Aphra and Star Wars were Doctor Aphra teams up with Luke and they go to this screaming Citadel. 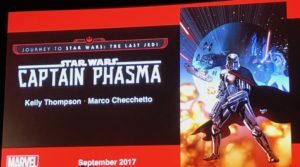 The Captain Phasma series was revealed at the Writer’s Roundtable but this panel went a little more in depth and confirmed it takes place with Phasma escaping StarKiller base. A Rogue One comic adaptation and six-part series is coming out that will have scenes not seen in the movie. Marvel contacted Gareth Edwards for insight into what he would want in the book. 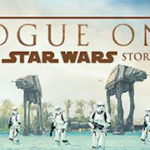 The director of Rogue One gave them ideas for clips he would have shown if the movie were longer, like a director’s cut of the movie. Also announced was the new Darth Vader series, previously touched on at the Writers’ Roundtable. The story begins in the first issue seconds after the end of Darth Vader’s scene in Revenge of the Sith. As a series it will be about how Darth Vader deals with what happened to him on Mustafar. He realized his losses and terrible things but doesn’t reflect on them. In doing so Darth Vader keeps a hold of his anger and continues doing evil things throughout the galaxy under orders from the Emperor. 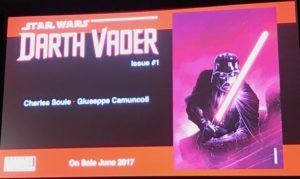 The first issue will also be about him getting his red lightsaber. He lost his blue lightsaber on Mustafer and Obi-Wan takes it and now must construct a new one. In the series we will also meet the remnants of the Jedi as Darth Vader is sent to eliminate the remaining Jedi surviving after order 66. 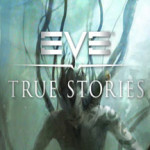 This series was also done because the story group was looking for a new story that wouldn’t take away from those tales. It was also a way to explore this character and how he became the Darth Vader we see in Rebels, Rogue One, and the original trilogy. John Taylor Christopher as a way to recreate the old toys discussed the Star Wars Action Figure Variant Covers. He revealed some of the original trilogy characters but then showed us his Director Krennic. They are based on the old Kenner line toys that had little mistakes. Some mistakes were Luke having a yellow lightsaber or neon yellow hair. For Krennic his cape is odd and the model slightly misshapen. However, the cover back is accurate and photo realistic and are based on photo references from the movie. First page of Poe Dameron Issue #13 showing the pilots in their X-Wings and an ugly in the lower right corner. 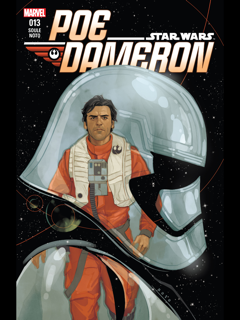 Then we came to one of my favorite comics, Poe Dameron. This series is about the X-Wing pilot Poe Dameron first introduced in The Force Awakens and the adventures leading Black Squadron against the First Order. Not only the First Order but in particular Agent Terex who was a former Imperial Stormtrooper. Our hotshot pilot has a new issue released on Wednesday, Issue #13. There will be big space battles, a loss, and it will wrap things up while opening new stories. One aspect of the series mentioned was in a space battle and the pilots in the X-wings are popped out in circles above their ships. This is so we know who is in the cockpit when they are communicating. Another thing we see in the Poe Dameron are what are termed Uglies. These are ships that were rebuilt with other ship parts. 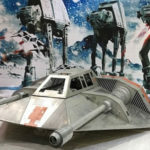 One page had a snowspeeder that was converted into a space worthy vessel. 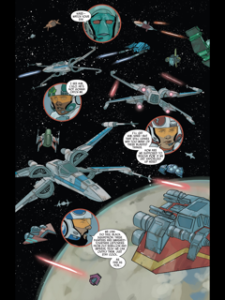 The Lando series by Charles Soule was a blast to write because he is only briefly seen in the films giving a lot of room for a backstory. His sidekick Lobot is in the series but his personality is different then what we see in Empire Strikes Back. In Lando he is a normal guy and how he goes from that to Empire Lobot is explored. Also, Lando steals the Emperors personal shuttle. That concluded the panel. One take away from this experience was there is so much more to explore in the Star Wars universe and the artists and writers continue to experiment with the stories. 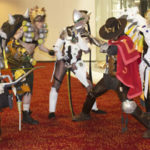 I came away from both panels with a sense that these authors and artists love what they do and that they work hard to bring the audience new stories and adventures. They are also trusted with these stories but being big fans of the series themselves they understand the importance of telling them right. We also see characters cross over to other media like games. For instance the audience in the panel was told that the Messenger from Shattered Empire appears in the Battlefront II trailer. 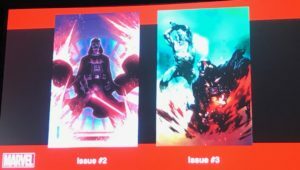 These two panels gave fans insight into their favorite stories, characters, and how upcoming stories will shape the Star Wars universe. Also plenty to keep a Star Wars fan busy, young and old.